Grohe is a European manufacturer of bathroom faucets and shower heads. 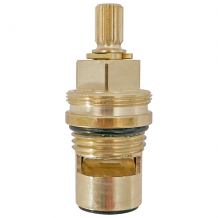 Equiparts carries Grohe faucet repair parts, which include left handed ceramic stems, S/L balancing cartridges, non-rising stem assemblies, thermostatic cartridge sub assemblies, and more. Call 1-800-442-6622 to speak to our knowledgeable representatives about Grohe faucet repair parts or inquire about Grohe faucet stem and cartridge pricing.